Nice frying pans for your kitchen! Try your culinary hand while cooking like this popular chef by using this terrific ceramic coated cookware__the Paula Deen Signature 2-Piece Skillet Set. Two different sizes of cooking pans allow you to use both at the same time on your cooktop or just one fry pan depending upon the recipe. The non stick interior surface is great for easy clean-up and the porcelain exterior in charcoal or red is an attractive addition to any kitchen. 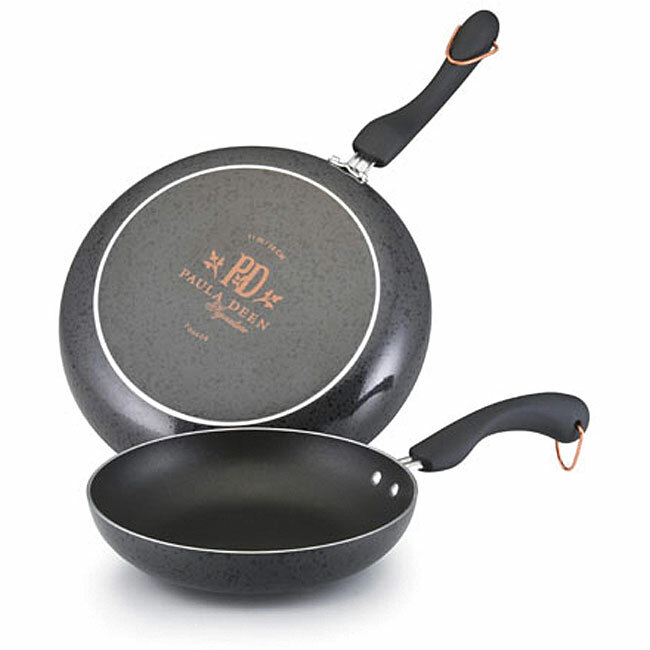 Heavy duty aluminum construction Produces durable frying pans that heat quickly and evenly. Non stick Teflon coating Makes clean-up a breeze. Curved handles Fit neatly in the palm of your hand for easy lifting. Handle material Remains cool during cooking decreasing your chance of hand and finger burns. Handle eye loops Provide a convenient way to hang these kitchen cooking pans for storage. Exterior porcelain surface in charcoal or red color Is easy to clean and offers a contemporary look for the kitchen.